The most common overuse injury to the knee is PFPS. PFPS may account for 11% of musculoskeletal pain complaints and up to 25% of all injuries in runners. The patella alignment may have been an issue for years but the repetition of running can bring on patients symptoms which makes them aware of it. Localised muscle weakness often medial muscles e.g. vastus medialis obliqus. Tight lateral joint structures e.g iliotibial band (ITB). Poor footwear e.g poor arch support/heel cup. Poor hip and pelvic stability e.g gluteus medius weakness. The success rate of treatment for patients with PFPS is largely dictated by patient compliance. One of the key components of treatment is that the patient rests sufficiently from ANY activity that increases their pain until they are symptom free. RICE (rest, ice, compression, elevation). Neuromuscular injury prevention strategies, including proprioceptive training. Chiropractic manipulative therapy (adjustments) and correction of lumbar-pelvic biomechanics. Muscle activation work to improve hip extension, motor patterns and running technique. Education for awareness and avoidance of supposed risk – Activities which place large amounts of stress through the patellofemoral joint should be minimized, these include: squatting, jumping, running and going up and down stairs. Exercising into pain must also be avoided. This allows the body to begin the healing process in the absence of further tissue damage. Ignoring symptoms or adopting a ‘no pain, no gain’ attitude is likely to lead to the problem becoming chronic. 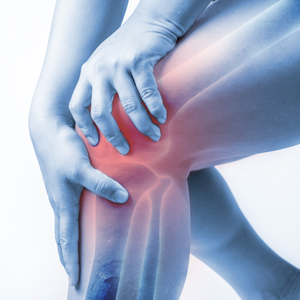 Immediate, appropriate treatment in patients with patellofemoral pain syndrome is essential to ensure a speedy recovery. Once the condition is chronic, healing slows significantly resulting in markedly increased recovery times. If you see this condition with any of your patients, please think of referring to us so that we can assist you in getting the best results possible for your patients.